For those who develop a fondness for ukiyo-e prints produced in Osaka, life consists of a series of small pleasures — literally. 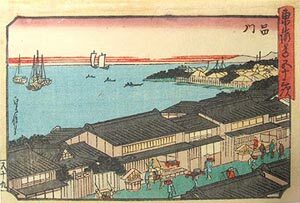 Most Japanese print lovers already know that, after experimenting off and on in the 1830s with a half-size format, (a size termed chûban, measuring approximately 18 X 24 cm), Osaka publishers and their public embraced this format with a passion from the next decade right on through to the disappearance of the Osaka print tradition in the 1880s. But what is far less known is that chûban were just the beginning of Osaka's "Let"s get small" attitude. On occasion the chûban was in turn chopped in half to produce a format called koban, resulting in prints roughly one-quarter standard size; and incredibly, in many, many instances, mameban — the name means "bean print" — each half a koban and barely larger than a credit card (approx. 7.5 x 12.0 cm), was the format of choice. (Even beans, it seems, were too large for some tastes, and we sometimes find where-to-cut marks printed down the mameban"s middle!) Altogether, a huge variety of publishing ventures, series that encompassed not only kabuki actors, Osaka's mainstay, but also beauties, landscapes, samurai legends, sumo wrestlers, and daily life and humor prints all appeared in editions of Lilliputian dimensions. Amazingly, the greatly reduced scale of these pictures did not necessarily mean a diminution in Osaka's famous bravura printing. Rich, deluxe pigments, laced with metallics and applied with precision and finesse, continued to be found in some of the miniatures, and strong compositions — often modeled on those of full-size prints — resulted in the pieces commanding a physical presence that totally belied their size. Also undiminished was the purely Osaka tradition of signing the prints with names that show up once or twice and never again. Such signatures presumably belong to established artists who felt the new formats required a fresh identity, or to fan club amateurs trying their hand at designing a print in the "everybody welcome" vanity press world of Osaka publishing. What could have provoked such down-sizing in Osaka? We have no evidence of mulberry shortages in the local washi paper industry, or huge economic dislocations, nor can we imagine a "small is beautiful" ecological consciousness developing among the Naniwa merchants. Instead, the attraction might simply have been the sheer fun and handiness of extreme portability. Especially prints of koban size or smaller are ideal for mounting in tiny albums. These albums, arranged accordion-style or stitch-bound, could be carried around in the sleeve of a kimono and produced in the teahouse where, in an atmosphere full of other intimate amusements, one could suddenly unfold an exquisite kabuki drama, travel up and down the Tokaido, or relive a samurai tale. The problem with this theory is that it leaves unanswered why a similar custom never gripped the public up in Edo. In truth, publishers in the capital did toy with small formats from time to time in this period, but they rarely went smaller than chûban, and then without care or conviction. Surely Edoites shared the Japanese penchant for miniaturization, and it goes without saying that they frequented teahouses, so what we seem to have here is yet another mystery in the world of ukiyo-e. Fig. 1, a mameban, by the Osaka artist Sadanobu I (active 1809-1879) is a downsizing of the Edo artist Hiroshige's Shinagawa station from a popular Tokaido series. Note the number "59" in the lower left corner, For Osakans, Shinagawa (now part of Tokyo) was the END of the line, not the start! Fig. 2 shows a mameban kabuki triptych, (with images, right to left, of Nakamura Tomijûrô II, Utaemon III and Danjûrô VII — their forms small enough to be dwarfed by the wood grain and a worm's trail), signed Shunhô (act. mid-1830s) and Shungyô (act. mid-1830s). This article originally appeared in Daruma, no. 12, Autumn 1996. Copyrighted © text and pictures reprinted with permission; revised 2014 to correct artist name from Shunpô to Shunhô.